Intel kicked off its Intel Developers Forum in San Francisco on Tuesday by showing off an Ultrabook with Siri-like functions, new gesture controls for PCs, and its newest Haswell Core processor aimed at the mobile-PC market. David (Dadi) Perlmutter, Intel chief product officer, led the keynote and shared his vision for a connected future—powered by Intel, of course. 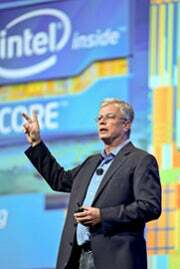 Perlmutter wasted little time and outlined how Intel was "redefining the computing experience," officially announcing its Haswell processor. The chip is the most power-efficient processor Intel has built, Perlmutter said, and it will allow the creation of thinner, lighter notebooks with touchscreens, all-day battery life, and instant-on functionality. He claimed that the chip is 20 times more power efficient compared with its earlier Sandy Bridge laptop chip, yet at the same time it increases graphics performance twofold. Intel's roadmap to "reinventing mobility," as Perlmutter put it, also includes speech, touch, and gesture interfaces for Ultrabooks, PCs, and a bevy of mobile devices. Perlmutter said Intel is working on delivering a “true interactive experience across all devices.” The goal is to give computers humanlike senses, he said. Journalists take photos of a board with a prototype Haswell chip during the Intel Developer Forum. Perlmutter then demonstrated speech-recognition software maker Nuance's Dragon Assistant program running on a Dell Ultrabook. The demo was similar to Apple's Siri voice-assistance technology. Perlmutter said Ultrabooks equipped with Dragon Assistant Beta will be available later this year. Perlmutter also showed off hand-gesture control of games and applications running on a PC equipped with a small Creative Technology camera and software developed by SoftKinectic, a company that makes gesture-recognition applications. Perlmutter said Intel would be releasing a software development kit to help PC and device makers incorporate speech, facial recognition, and hand gestures. To spur innovation, Intel is doling out $1 million in awards to developers who come up with the best ideas for its SDK. 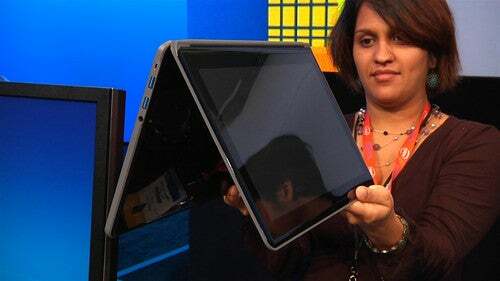 A concept thin laptop that Intel exec Dadi Perlmutter wants to run on a Haswell chip. Against a backdrop of sluggish PC sales and the rise of tablets and smartphones, Perlmutter also talked about Intel's "Medfield SoCo" Atom processor for smartphones and tablets. Currently Intel is noticeably absent from that market; but as desktop and laptop sales slump, Intel is pinning its hopes on Medfield. Perlmutter says its mobile chip will be an alternative to the competing ARM-architecture processors found in devices such as the iPhone, the iPad, and most Android smartphones and tablets. On stage, Perlmutter showed off a number of Atom-based tablets and claimed several "design wins" based on Intel's Clover Trail Atom-based platform. On the power front, Perlmutter discussed Intel's Xeon Phi coprocessor, which is designed for high-performance computing. The digitization of data, coupled with the boom of social media, has been a gold mine for the company, with Intel processors becoming the brains and brawn behind the necessary number crunching and data centers. Although Intel may not dominate the market for the chips running inside smartphones and tablets, it does dominate the cloud that those devices connect to. Intel likes to point out that most of the high-end servers that power the Internet carry the company's high-end chips, such as Xeon Phi coprocessors. 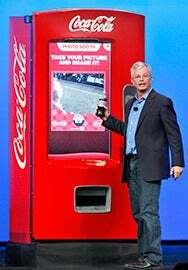 Perlmutter closed his keynote with the oddest demo of the day: a Coke machine with an embedded Intel Core i7 CPU. The vending machine had a large multitouch screen, an integrated camera, and Wi-Fi. It served both as a demo and as Intel's attempt at illustrating the ubiquity of the Intel chip architecture and how much PC technology has become a commodity.